Enjoy a special hands-on tour of the mill at 11:00 a.m. and 12:30 p.m.
Make cornhusk dolls, cup & ball toys, marbles, and tops. Play with traditional toys and games on our lawn. 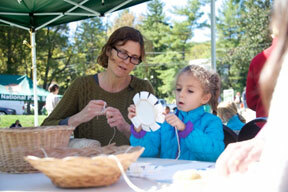 Family workshops are designed for children ages 3 and up, but all are welcome. No reservations are required for this FREE event.